There are many ways that your child can learn the letters of the alphabet. They can watch any number of wonderful children’s television programs and play educational games on a tablet or computer. But here, I’ll show you some simple things you can do at home, the old-fashioned way. ​Despite all the fancy toys and games you can buy, I’ve found children often prefer home-made things. · Say the name of the letter and say the sound it makes. · Ask the children’s librarian at your public library for ABC books, or buy them at the bookstore. · This is an easy way for your child to learn the letter names. · If you don’t know the song, search for it on the Internet. Play with letters in the bathtub. · Buy some sponge letters. Float a letter in the tub at bath time and name it. · Once your child knows a few letters, ask your child to find and sink specific letters. Use soap paints in the bathtub. · Write letters on the tiles with the soap paint. · Have your child write the letters. · Name them. Say their sounds. · Write your child’s name on the tiles. Make letters out of play dough. · Roll out the play dough and shape a few letters. · Print a big letter on a sheet of paper or cardstock and have your child cover the outline of the letter with play dough. · Start with letters your child already knows, and then add unknown letters. · Do your child’s name out of play dough. · Demonstrate how to run your finger over the letter the way you’d print it. Then ask your child to do it. · Give verbal directions while you model how to trace the letter. · For an uppercase “A”, say: “Down, down and across” while using your finger. · For a lower case ‘a’, say: “Around and down, around and down” while using your finger. · There are many recipes online for homemade play dough. · Print our child’s name on a piece of cardstock or construction paper. Make the first letter a capital followed by lower case letters. · Make the first letter about 10 cm. tall. · Say the names of the letters. · Go over the letters with glue. · Provide colourful cereal circles, or mini-marshmallows for your child to glue onto the letters. · Give your child a bucket of water and a big paintbrush and let him or her ‘paint’ letters on the sidewalk. · Say the name and the sound the letter makes. Draw letters in the sand. · Draw letters with a stick in the sand at the beach or in the sandbox. Name those letters. Say their sounds. · Draw letters on the sidewalk with chunky sidewalk chalk. · Make fish with a letter printed on each fish. · Print one letter on each fish: an uppercase ‘A’ on one fish, a lowercase ‘a’ on another fish, and so on. · Attach a paper clip to each fish. · Make a fishing rod using a small stick (a chopstick, a paint brush, a dowel). · Attach a string with a magnet on the end. The magnet will pick up the fish by the paper clip. · Make it easy. Put only 3 fish on the floor face down so you can’t see the letter. · You can use only lowercase letters to start with. In time, you can add the corresponding uppercase letters. · Your child will “catch” a fish, turn it over, and tell you the name of it. · Always include letters your child already knows and add one new one at a time. · If your child doesn’t know any letters yet, start with 3 fish, but when your child catches one and turns it over, you name the letter. · Variation: Once a few fish have been collected; have your child match the upper case letter with the lower case letter. · Variation: Lay out 5 different fish face up. Ask your child to catch a specific letter. These are low-tech ideas but your child will have some hands-on fun while interacting with you! 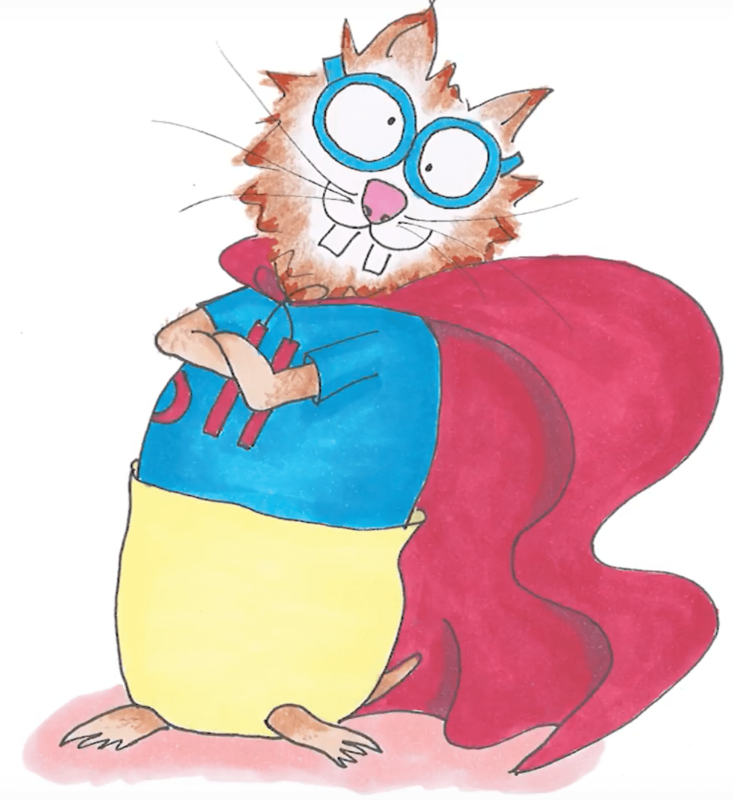 Coming soon…my new Super Hammy ABC books in English and French from DC Canada Education Publishing. Super Hammy – My First Reading Series. 15 engaging books for beginning readers. Previous Super Hami Est Disponible En Français! Next Teach Your Child the Alphabet with Magnetic Letters Not Tablets!